Hi, I am interested in your 1984 Chevrolet C/K Truck (stock #4877-CHA) listed on Autotrader for $13,995. I'd like to get more information about this vehicle and confirm its availability. 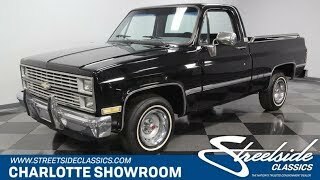 Great upgrades, V8 power, an overdrive transmission, and a value price this 1984 Chevrolet C10 Silverado does a great job of turning heads and making people you paid far more. Black is beautiful, especially when youre looking at a more recent application with a terrific gloss coming off the clearcoat. As the light reflects off this deep luster, it also highlights all the well-creased sheetmetal that made you love this generation Chevy truck. These beefy lines are nicely balanced out by the premium Silverado package with bright chrome bumpers, and a trim line that runs down both side and wraps around the rear. Plus, this has plenty of nice upgrades like the bright bed rails, trailer hitch in the bumper, and sporty spinners in the Rally wheels. Inside this one reminds you the Silverado was the top trim with its premium presentation. The seat cover is newer, and its made of a comfortable velour cloth. The black and silver on here is part of a coordinating package with the door panels, carpeting, headliner, steering wheel, and dash. This is set up to be a drivers pickup, with all the essential controls surrounding you. Plus, you have great features like power windows, power locks, a tilt steering column, and an AM/FM/cassette stereo. Under the hood this truck has been upgraded to Chevys trusty 350 cubic-inch small block. Just like the exterior, the engine bay looks great with plenty of glossy black and nice polished accents. The V8 inhales deeply with an Edelbrock four-barrel carburetor, and it exhales with authority as ceramic-coated headers add power while also contributing to the rumble of the dual exhaust. Out on the road, features like power steering and front disc brakes make this a great cruiser. Theres even a four-speed automatic transmission. This long-haul friendless gets even better with the dual fuel tanks. Complete with the original warranty card, you can see the value in this truck goes well beyond the affordable price. So dont miss your opportunity at a standout Silverado. Call now!